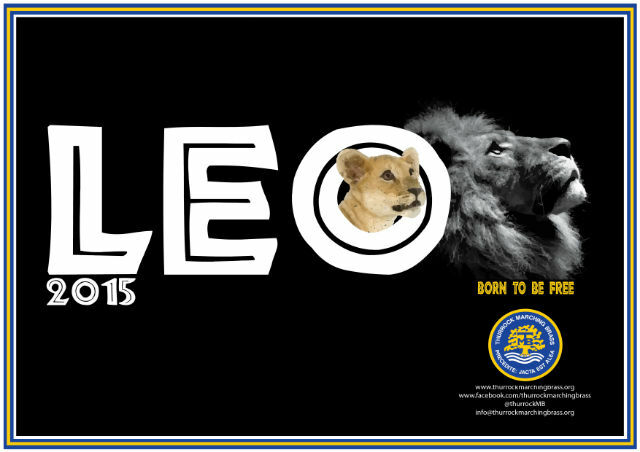 Thurrock Marching Brass is pleased to announce their 2015 Summer Corps show entitled “Leo”. This program follows the journey of young cub Leo as he grows into Lion-hood with all the challenges that brings, as well as the fun and laughter along the way too, with music arranged by World Record holding composer and arranger, Reece Crisp. Act 1 Birth – Born to be wild:- Leo is born, with music from Born to be wild, written by Mars Bonfie, as performed by Steppen Wolf. Act 2 Playful Cubs – Hakuna Matata (No Worries):- Leo plays and frolics and gets captured, using music written by Elton John and Tim Rice. Act 3 Restrained – Born Free (Ballad):- After being caged, Leo sets about his escape to the timeless classic Born Free, written by John Barry and Don Black. Act 4 The escape – I’m Free:- Written by Pete Townsend (The Who). Speaking of the program, Thurrock Marching Brass’ corps director, Ken Mansfield comments “This is going to be a really challenging year as we start to push our talented members forward and develop on the very enjoyable and successful 2014 season. With new levels of musical arrangements by Reece, and more challenging emotions and visual compositions lined up I know that each and every member will be having a ball with this one, as will all of us involved in creating and teaching the program to them”. Thurrock Marching Brass would also like to confirm that they have registered their interest to compete at the 2015 Drum Corps Europe Championships in Kerkrade, Holland in Junior Class, which marks yet another positive step forwards for this young talented group. Adding to the above, Ken says “We are all about giving our member base the very best experiences possible, and so we have registered our interest to compete at the DCE Championships for 2015. Taking these talented kids to Holland will bring its own challenges, not least cost, but with a firm and solid support structure here at Thurrock Marching Brass, I am extremely excited at the prospect of giving our youngsters an experience of a lifetime by letting them compete on the same field as the best Junior Class Drum Corps in Europe. Winning isn’t our ultimate goal, but I just know that everyone involved will be working hard to do the great name of Thurrock Marching Brass proud as they have always done, and so for us, the experience for them all is the single most important aspect of this trip”. Thurrock Marching Brass are proud to perform as much as they can within the community and you can keep up to date with all their engagements on our website below or by following their exploits on Facebook. Posted by News Editor on Friday, November 28th, 2014. Filed under British Youth Band Association, FrontPage Feature.